Sakura is Genesis 8. So I don't see why not? Yes, she is still part of the Genesis 8 Female family. All of your existing G8F clothing and hair and morphs will work just fine. Poses and animations will need a little adjustment the same as any other character shape. Yeah that's odd. The store page lists Genesis 3 Female as a requirement, not G8. And the readme and the filelist all mention Genesis 3 Female, no Genesis 8 at all. But are we going to have a boy? I promise myself if a stylized female doesn't have a boy counterpart I can't justify buying the her. Hey all, I was late to see the release! Very excited about this character! Ditto; gone are my days of snapping up characters like Keiko and then not being able to use them to the fullest because they’re a single-gender race. Until official word comes down that a male will follow, I’m going to pass. With Keiko, a couple of artists here did some amazing work mocking up a passable male, but for the amount of extra work and expense, and the inability to fully use and mix other male DNA, I’ll pass. I’m still hurting a little because we never got a female Morpheus. Here is the "coming soon" commercial thread link for the eyes I mention above, so don't let those eye movement concerns prevent you from trying her out! They did a great job with this figure! A ton of extra's that I did not expect were included. Very fun character! Speaking of eyes, I've got an add-on pending the Daz store commercial release that has new spherical eyes. Look forward to seeing your add-on in the stores! Given what others have said, existing head morphs are likely to be tricky to mix with Sakura due to her extreme eyes. Sort of glad this is the one released now..I was thinking she'd be an asian character like Mei Lin, and then I'd have to ante up! Sakura is kind of cute, but I don't really have a need for a toony character. Something about that seam down her nose stands out though, have to say, I like Keiko's face a little more, seems a bit more rounded but still anime.. Finally, a stereotypical anime female head/character from Daz! Good one. I bet there's a Bishonen in our near future, too. RareStone is rare indeed. I'm happy to see a really stylized offical release. she's got a great support bundle too. I didn't really get into some of last gens toons, missed most of them actually. Some I didn't even know existed! But this gal caught my eye imediately. Also I'm a sucker for getting prior generations bundles included for free. Daz releases so many figures that I have to ignore the majority of them. So I tend to be missing stuff. This time around I get callie and the last bits of keiko's collection I missed. Its not a seam what I think you are seeing is lighting shadows and highlights causing the sharp angles of her face to look a bit odd. Ah, lighting issues then..Doesn't really matter too much as I don't have a need for toony right now, but some of the morphed pics people have posted are cute.. I'm amazed at how many shaping morphs she came with, such a treasure. The breasts, ribcage, thigh and waist morph adjustments are well thought out and I really appreciate the extra effort. they really help you style her the way you want, and makes her a platform moreso than most characters these days. I'm sure she will be useful for many years to come. OMG i spoke too soon, finding even more customization morphs for the face. woot, such a good package. Its the thing that makes her worth keeping. 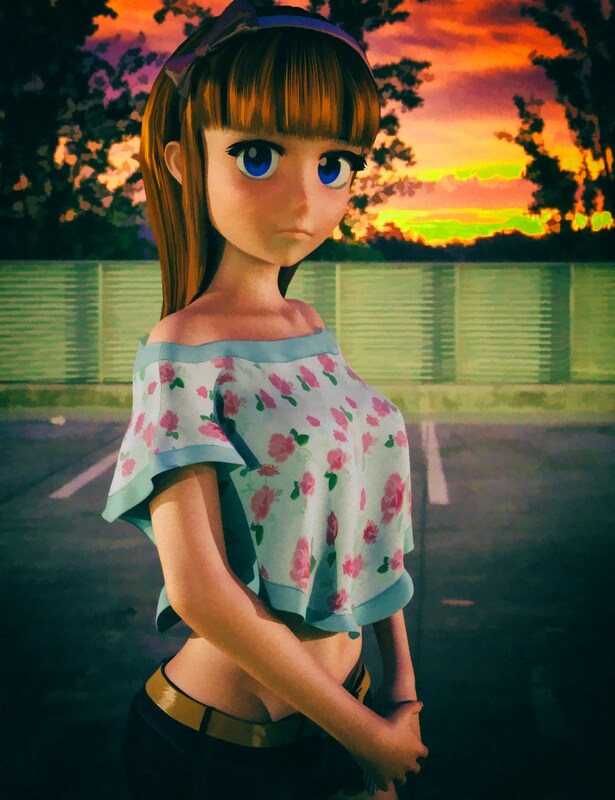 I want to take this time on this thread (since its Sakura 8 thread) to thank Daz3D for creating a "Keiko 8" figure. Its not Keiko 8 by name, but Sakura 8 is Keiko in spirit, theme and form. Thank you Daz for listening to us and taking our requests to heart. I (and I am sure others) appreciate your the time you invested in and other PA's who contributed to Sakura's develop. You have given to me and others and I give right back to you by purchasing it. Thank you again. This is wonderful and awesome. btw, sorry i didn't read all thread. but is it known that the advertised long pigtail hair is giving me a 404? EDIT: guess it doesn't matter i was able to download it. NIce! I'd like to see a bit more DNA in this pool, but at least GenX users should be able to fudge some companion figures together using a mix of various other toon morphs on Genesis 3. Personally, based on what's hjappened with the last several generations, I think that the odds of DAZ putting out an official male companion are pretty slim, but I expect that there will be at least a few PAs and freebie artists who'll put out some "masculinized" versions of Sakura herself. Same here. I like watching anime, but have no desire to render it.Those that do, enjoy! Wait, what is "Unhide G8 male clone?" And where do I find that? Some of the promos look really cute. Some just... don't work for me. She mixes pretty poorly with the default eyes she comes with IMO. I haven't tired those two shapes you mentioned as I haven't purchased them. But in general her new eyes aren't working well other faces. which is abnormal even for a toon character. I'm going to try not using her character preset with the new eye sockets. going to see how bad it is using her head witha normal set of eyes. someone said they were going to sell spherical eyes for her, can't wait for that.